A high-quality roasting pan can make your cooking experience more fun and exciting. It can even turn a simple meal into a sumptuous one. After careful research and product testing, we are giving the best roasting pan in today’s market. 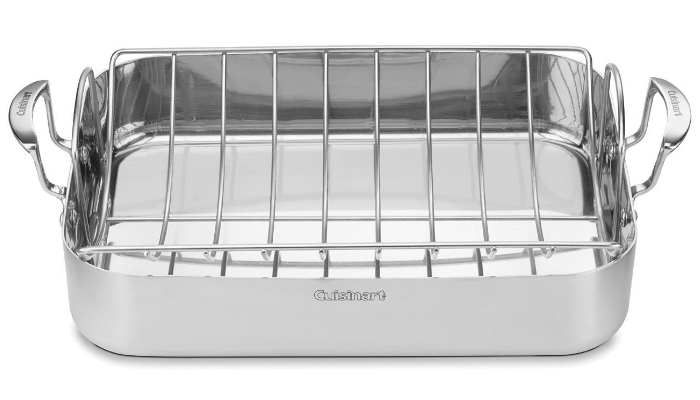 Cuisinart MCP117-16BR MultiClad Pro 16-Inch Rectangular Rack Roaster has a durable, sturdy construction because of its triple ply stainless material. Its rack is also made of solid stainless steel. This roasting pan ensures that the meat will be evenly cooked, thanks to its effective heat surround technology. It is induction-ready and totally safe to clean in a dishwasher. 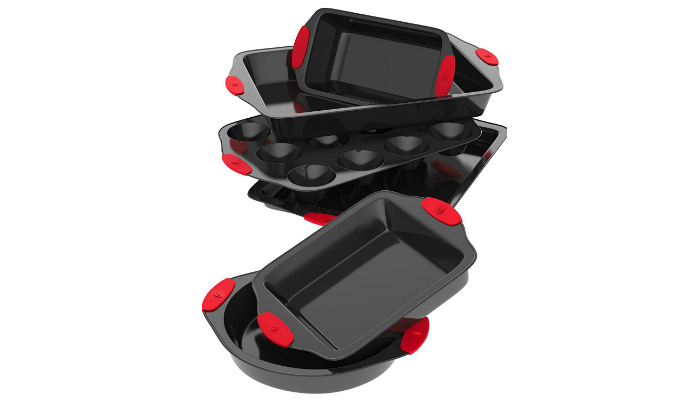 Vremi 6 Piece Nonstick Bakeware Set with Large Roasting Pan also includes a huge cookie sheet, a round cake pan, a muffin pan with 12 cups, and a square baking pan. 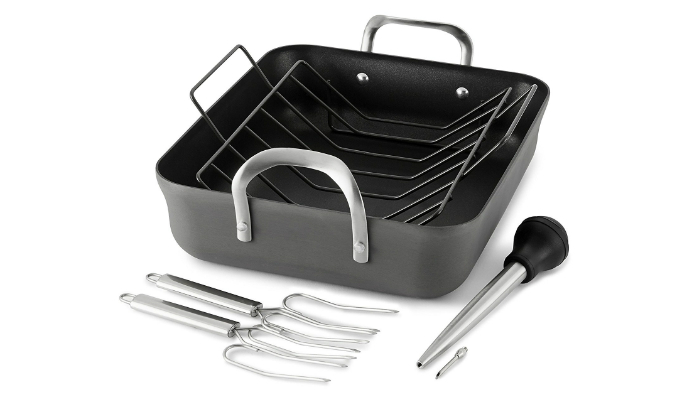 The nonstick feature comes from this product’s carbon steel metal composition. It makes sure that you will not do any scraping while washing for easier cleanup. Everything in this set has handles made of silicone for a more secure grip even if you are wearing thick oven mitts. The vivid red color of the handles perfectly matches with pure black carbon steel. 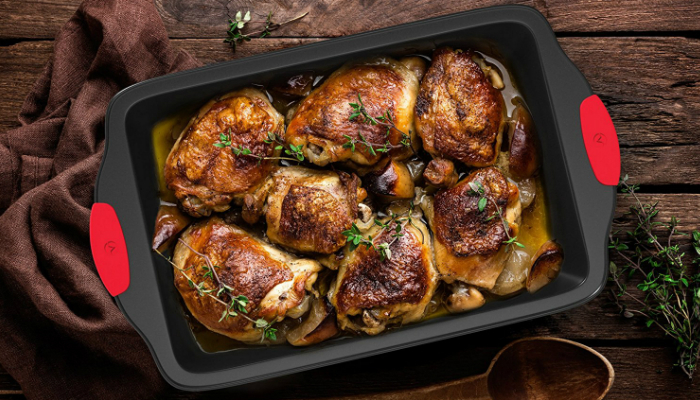 The roasting pan’s overall design promotes faster cooking to make your last-minute dinners successful. 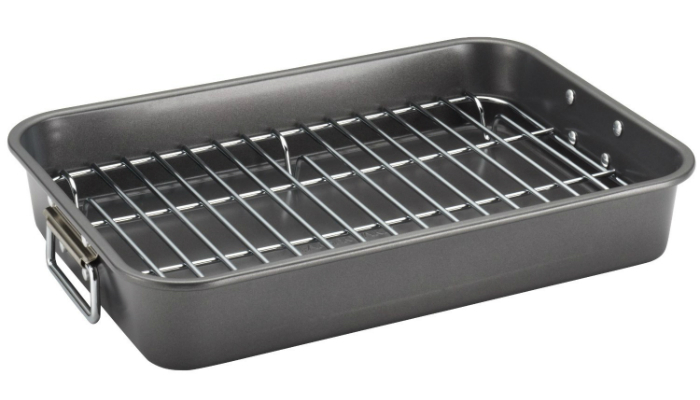 Farberware Bakeware Flat Rack Roaster is nonstick everywhere, even the outside surface, so you can easily clean it. Its heavy-duty material, design, and form ensure that it will not warp from intense heat. Calphalon Contemporary Hard Anodized Nonstick 16-Inch Rack Roasting Pan interestingly has three layers of nonstick coating inside. Why? The two layers focus on durability while the third one aims for quick release. Even if this roasting pan is full, you can still lift and turn it without any hassle because of its handles made of brushed stainless steel. This product can hold meat up to 25 pounds. It guarantees perfect browning of food by having a unique V-form rack. Cook Pro 561 4-Piece All-in-1 Lasagna and Roasting Pan can also be an attractive serving dish because of its stylish exterior that is meticulously polished for that mirror-like shine. 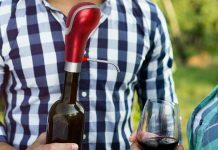 It can last for a long time despite frequent use due to its durable stainless steel material. 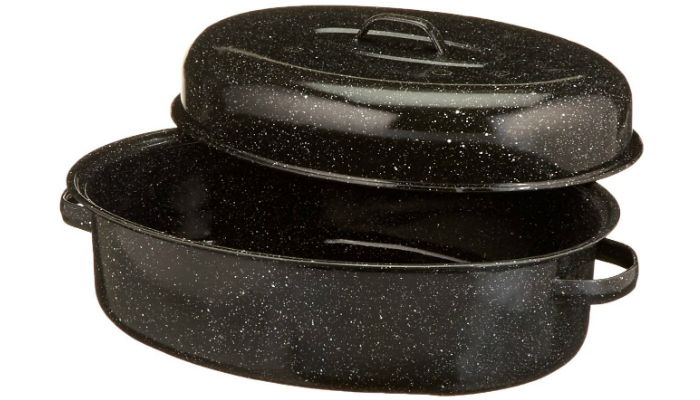 Columbian Home Granite Ware 0509-2 18-Inch Covered Oval Roaster is safer and more energy-efficient than roasting pans made of foil because of its carbon steel core. More about the materials, the surface is non-porous due to porcelain enamel. Talking about safety, this roasting pan does not contain PTFE, PFOA and other dangerous chemicals. Meanwhile, the cover guarantees a more delicious roasted meat that is juicier or moister. There are several varieties of roasting pans when it comes to material. One is made of aluminum which is a common type of roasting pan nowadays. 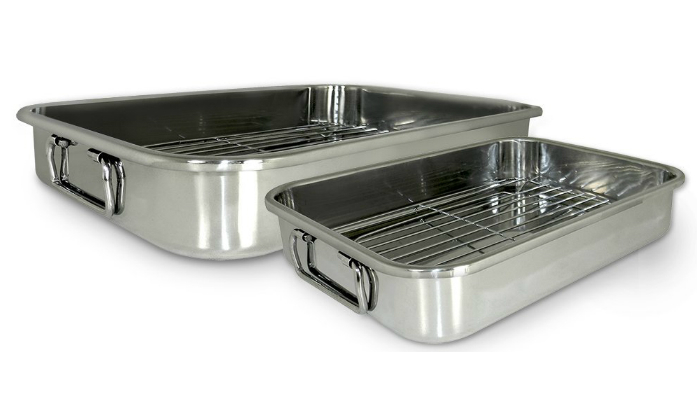 An aluminum roasting pan is lightweight and has good heat conducting qualities. Anodized aluminum, specifically, is nonstick and can help darken the color of meat while roasting. Another common material for roasting pans is stainless steel. It is one of the easiest to clean and works best with food containing sauce like gravy. Cast iron is another easy-to-clean roasting pan that has good heat conducting qualities. It also retains heat well. However, it is heavier than other pans. For a more effective cleaning of your cast iron kitchenware, you may get ideas from our tips on how to get the rust off a cast iron skillet. And, if you want an eco-friendly option for your roasting, a stoneware pan is the right choice for you. Stoneware, usually made of fire-treated clay, has good non-stick performance without causing toxins and other harmful fumes when used. It also has great heat retaining and transferring potential. 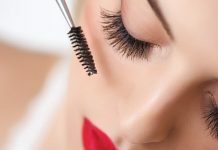 It is scratch-resistant which makes it easy to maintain as well. Roasting pans vary in weight because some can be too heavy to carry while others are lightweight yet tend to deform or break easily. The best roasting pan should be heavy enough to withstand heat inside the oven or on the stovetop. However, it must not be too heavy that it becomes a struggle just to get it out of the oven. In terms of having the right weight, metal pans like stainless steel and aluminum are great options. Aside from weight, you should also consider the pan’s depth. The height or depth is important because it can affect the amount and cooking time of food. Having sides that are too high can cause hot air to rise quickly, leading to the improper cooking of your food. Too low and it can cause the juice from your dish to spill and get your oven dirty. The ideal depth should be five to eight centimeters to accommodate good air circulation and an effective sauce-retaining wall. For the ideal size, the pan should be big enough to hold your food inside without its walls or sides touching the meat. This is to allow air circulation internally and cook the underside of the food perfectly. Consider getting a pan that is at least five centimeters larger on each side compared to the meat you are cooking. Avoid using pans that are too large because they can burn the meat’s juice. On the other hand, if your pan is too small, you tend to lose the juice or gravy because the meat absorbs most of it. That should not be the case when you are roasting. As for the shape, a rectangle is an ideal form for a roasting pan. Meanwhile, the ones with rounded edges can make the preparation of your gravy more convenient. Other features to look into when choosing the best roasting pan are the handles, rack, and nonstick ability. Handles vary from horizontal to vertical ones. Horizontal handles are easier to hold but tend to increase the overall size of the pan. Choose horizontal handles that curve towards the pan to minimize the size and ensure that it will fit the oven. A rack prevents your roasted meat from getting wet and sloppy. 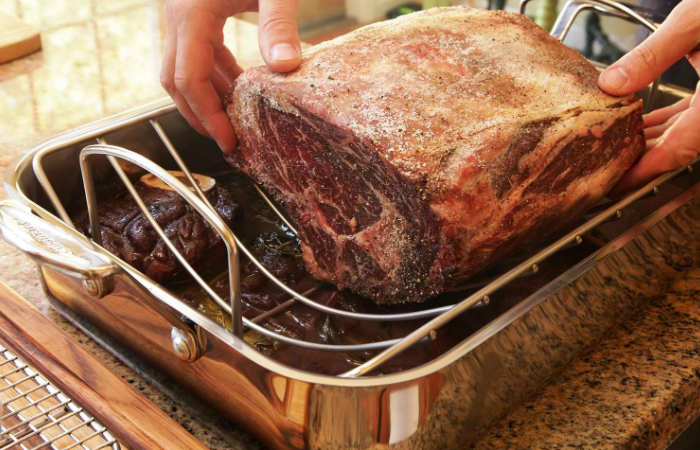 It promotes even roasting and easier collection of juice from the meat so you can use it later as gravy. Cleaning is easier with nonstick pans. However, having a nonstick pan is actually not necessary. You will need a sticky surface when making gravy to develop better flavor from the meat’s juice and bits sticking to the pan. For easier cleaning without the nonstick feature, you may resort to a stainless steel roasting pan or simply use a rack when roasting. We selected Cuisinart MCP117-16BR MultiClad Pro 16-Inch Rectangular Rack Roaster as our top product because of its overall intense durability, effective heat circulation, and dishwasher-safe feature which is kind of a rare thing for roasting pans. Material, weight, depth, size, and shape are the major factors to consider in choosing the best roasting pan for your cooking needs. Handles, racks and nonstick features are bonus considerations because not all roasting pans have these. It only goes to show that these features are not really necessary for the main purpose of a roaster. If you want to roast something other than the usual chicken and pork meat, then you might want to learn how to cook pheasant in two ways – roasting included, of course. Also, You may want to check our take on how to smoke food and oysters. Meanwhile, for other types of pans, you can put in an oven, check out our take on the best pie pans.